The nation’s capital punches well above its weight in the craft beer stakes, says Bentspoke Brewing founder Richard Watkins. Watkins spoke with Radio Brews News as Bentspoke celebrated its first anniversary of operation in Canberra, having brewed 160,000 litres and 31 different varieties of beer and cider in the process. He said he thrives on getting direct feedback from customers in the brewpub environment. 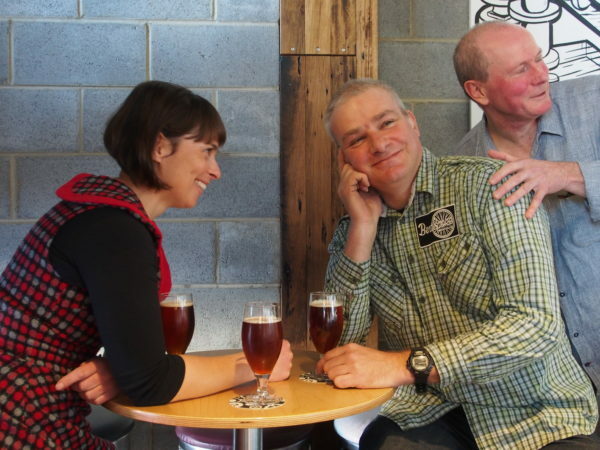 And with a strong tradition of homebrewing and few pubs in the city, he believes Canberra’s beer drinkers are some of the country’s most educated. “In Canberra we’ve got three breweries and we have 350,000 people,” he said. However, Watkins said that he has become disillusioned with the term “craft beer”. “A lot of people find it pretentious,” he said, suggesting it disparages the dedication of the hard working brewers at Carlton & United Breweries and Lion to producing a consistently high quality product. “I’m sure the guys in the XXXX brewery… feel that they spend their days crafting beer and they probably do. It’s just different beer to the type we make,” said Watkins. Bentspoke brewed a series of special beers to mark the first birthday milestone, including a strong Scotch Ale named Blow Your Bagpipe, the third in a series of historical beer styles to be produced by Watkins in collaboration with beer historian David Hughes. Episode 56 of Radio Brews News is available here. I agree with Richard regarding the term “Craft” which is why I announced whilst hosting the AIBA awards dinner that I have given up Craft and now just drink Good beer wether it is from a big brewery or a small one. I have noted a movement or backlash against the term ‘craft’ from some fairly well respected figures in the industry within Australia and overseas. Perhaps as a marketing term it has had it’s day? For me it has.